Info Michael Holcombe Wilson is a Canadian politician and business leader. Wilson was a Bay Street investment executive when he was elected to the Canadian House of Commons as a Progressive Conservative MP in the 1979 general election. 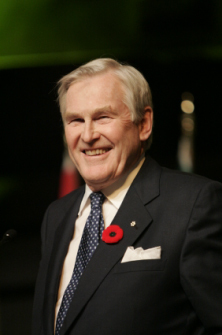 He served as minister of state for international trade in the nine-month minority government of Joe Clark. In 1983, Wilson was a candidate at the Progressive Conservative leadership convention but dropped off after the first ballot (despite having the rock group The Spoons peform on his behalf) and threw his support to the eventual winner, Brian Mulroney. Mulroney appointed Wilson minister of finance when the party formed a government after the 1984 election. Despite promises to balance the budget, Wilson ran large deficits throughout his tenure as finance minister. He reformed the tax code to make it more business-friendly, and helped negotiate the Canada-U.S. Free Trade Agreement. Wilson also introduced the unpopular Goods and Services Tax in 1990. After seven years in finance, Wilson became minister of industry, science and technology and minister of international trade in 1991 participating in negotiating the North American Free Trade Agreement. Wilson was not a candidate in the 1993 election returning to Bay Street to head his own consulting and financial services firm. In recent years he has become a spokesman for a lobby group promoting Public-Private Partnerships. In September 2003 Wilson was installed as chancellor of Trinity College. This position is of an almost entirely ceremonial nature.